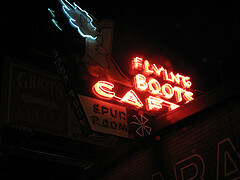 Flying Boots Cafe and Spur Room, so tonight I stopped to take a photo and consider it as my new place of the day. Tacoma Public Library shows the Flying Boots Cafe opening in 1930 and the new cafe opening in 1955 after remodeling. 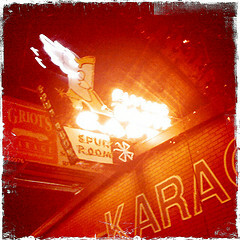 The bar part of the restaurant is called the Spur Room, and yes they have Karaoke. At night the neon wings on the boot turn on and off. This entry was posted in Coffee Shops, cafes and bistros, Historic Sites, Over 21, Restaurants, Sit Down Establishments, Tacoma, WA State - Pierce County and tagged bar, cafe, Flying Boots, food, Karaoke, Lincoln District, neon, restaurant, South 38th Street, wings on December 15, 2010 by admin.